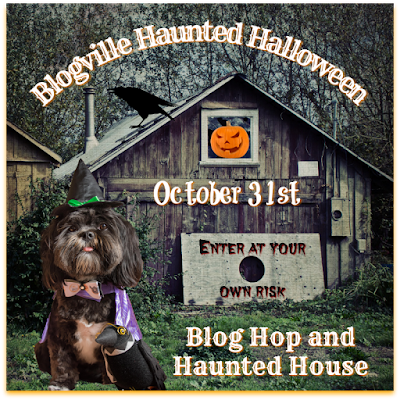 The Legacy Chronicles: Happy Howl-o-ween! Hi, everyone!! I'm enjoying my very FURST Howl-o-ween!! Furst, you have to see my beeYOUtiful costume! Pigeon says she's going as a spoiled cat this year. She has her costume nailed too!! Next, it's time for our spooooooooky story for Blogville's Haunted Howloween. Ooooooooh!!! It was a dark and stormy night. Thunder crashed across the sky, and I wasn't wearing a thundershirt! I tried to snuggle next to Momma to make her feel better, but she kept standing up and doing weird things like cleaning. It was like she was POSSESSED! And then....she said, "Don't worry, Matilda. How about a little treat to make you feel better?" THE TREAT JAR WAS EMPTY!!!!!!!!!!! OMD, OMD, I just skeered myself!! It's just a story, Matilda, it's just a story! That could never happen!! Um....I think I'm going to go check on our treat jar JUST in case. Be sure to join the rest of the Blogville Haunted Howl-o-ween for more skeery stories. An empty treat jar is a VERY scary thing! You look beautiful, Matilda! 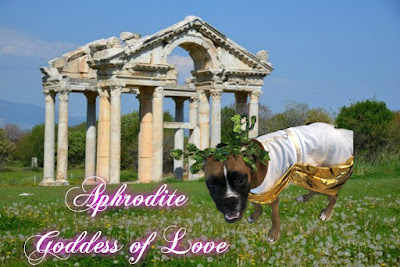 oooh da goddes of love!!! how beautiful! ...but someone has to come to fill your treat jar.... an empty one is super scary... happy howloween!!! OH NO!! The treat jar was EMPTY??? That was a fictional story right??? Happy Halloween! Thanks for hopping with us today! Now that is a scary tale to be sure! Hope you gets lots of treats tonight! Oh, if that were a true story, that would be VERY scary, Matilda. But we are sure your Mom would never be treat-less!!! An empty treat Hijra - what a terrible trick! Happy haunting. Oh my goodness, that is the scariest story ever! An empty treat jar? The horror! PS You look so cute in your costume Matilda. OMD No Treats that are a terrifying story!! That is a real horror story! Well hope you have a Happy Howloween just the same. YIKES!!! A empty treat jar!! The horror! !